This makes all the work worthwhile...to be able to create freely with the sheets of stitchpaper you've been making. These are super simple rectangular cutouts. Normally I back them with felt, but I tried something different since one of our swap partners used lutradur on her backs. I picked up some inexpensive interfacing--tried to find the stiffest that was not too thick. I dyed sheets of it with alcohol inks. My method was to soak the interfacing in alcohol, then crumple it up and drip with alcohol inks and rub it together in a ball to distribute the ink. I used a few colors and crumpled until I was satisfied. Then I rinsed them to get the alcohol out, sprinkled them with a little bit of Schminke gold powder and dried them , then ironed them. I added a little spray starch to the final ironing. They came out beautifully. I stitched them to the backs of the bookmarks. I didn't take photos of the backing, but may make some more because they were so gorgeous. I cut it into strips for the top of the bookmarks as well. I stitched the word "read" on the front, then I added a paper bead for fun! I'll give one of them away. Leave a comment here and I'll draw a winner on 1/30/10 and mail you a stitchpaper bookmark (if you're already in the Yahoo book study bookmark swap, you automatically get one, so feel free to comment but opt out of the drawing). I'll announce it here and on Twitter and email you if there is a link. 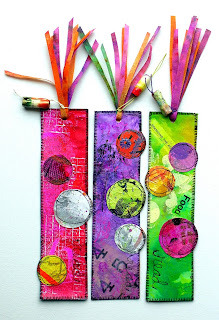 FABULOUS idea - painting thick interfacing. I got some odd bits in a bag of goodies from the neighbour....will have to try this! Oh, what a great idea! Like you said, super simple but really gorgeous. Too pretty to hide away inside a book! Pick me! Pick me! Love your art! These are so gorgeous! Thanks for sharing. I mailed my swaps last week, so I opt out of the drawing, but I can't wait to see them! Amazing colors and textures! I just brought your new book :) Fantastic! I adore painted interfacing. I've made several quilts where the entire front was appliqued from just that. The cactus quilts with copper wire spines are interfacing. Love it! And love the clever little bookmarks! I'm an avid reader, so I sure could use one. Those are really cool looking. I am fascinated by this whole craft. 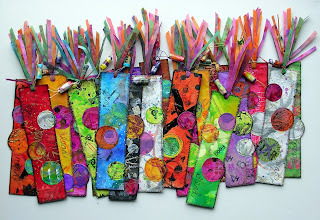 Great bookmarks - such lovely colors! I love your work! Such bright colors. Make me excited to think I could have one. Thanks for offering. These bookmarks are gorgeous and I lvoe the beautiful stitchpapers below. I was lucky enough to receive your book for Christmas but haven't had chance to play yet. I will definitely be getting busy soon! These are beautiful !!! The bright colors make my heart sing (especially as all I see outside my window is white and grey here in New England !) Thanks for the chance to win some colorful warmth ! The colors are so yummy !! These are really cool. Sure would like to touch one. such vibrant colors, lovely & yes please! Oh these are gorgeous, whimsical, fun and colorful! Looks like you had so much fun making them! These are wonderful. I just found your site and look forward to keeping up with your adventures. Maybe I'll be lucky in the drawing?? Mailing a bookmark to 2worlds. Thanks everyone!